Scented Pelargoniums, scented geraniums as they are still commonly called, have the distinction of being “Herb of the Year” in 2006 as selected by the International Herb Society. In the world of herbs, scented geraniums/ pelargoniums exude distinct flavors not only when blooming, thanks to their scented leaves. There are hundreds of varieties to allow you to choose the scent you like more: apple or coconut, apricot, lemon, lemon-rose, rose, orange, nutmeg, oak or champagne; the intensity of their fragrances; the shape of their leaves or the color of their blossoms. Scented geraniums have a long history. Initial, in the early 1600's, in the "Age of Discovery", John Tradescent, botanist and plant explorer for Charles I of England, brought from South Africa to England Pelargonium Triste, one of the few exotic scented geraniums with fragrant blossoms. 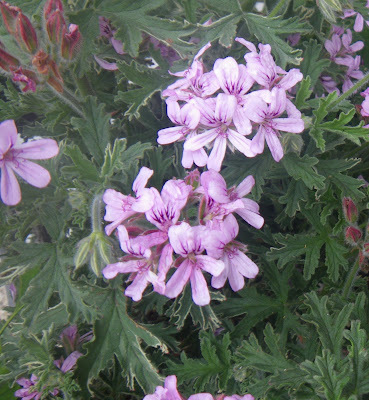 Scented geraniums became popular for use in making perfumes, and soon were cultivated in the warm coastal regions of France , Spain, Algeria and Belgian Congo. The colonists brought scented geraniums with them to the new word. Even Thomas Jefferson grew them in his gardens at the White House. Today scented rose geraniums continue to be used in the perfumes industry. Synthetic rose oil is made using rose scented geraniums. The dried leaves are also used in sachets and potpourri. 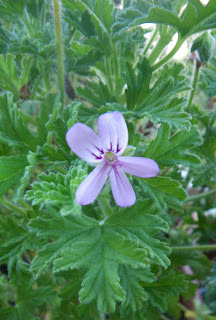 In aromatherapy rose scented geranium is used for facial steams as it is reputed to have anti-aging effects on the skin. Their leaves are used for personal fragrancing, bath or body oils and more. I love rose scented pelargoniums/geraniums since childhood. I was always impressed by the strong rose fragrance of their leaves. I remember that my grandma used to add a bunch of "Drusaim" leaves in boiled fruits, cookies, gems and jellies, and all the times an explosion of delightful blended aromas invaded my mouth. 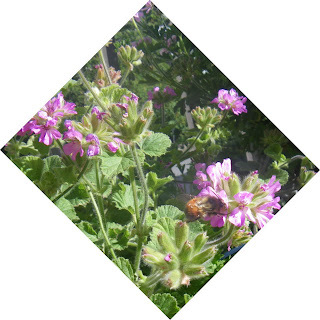 When I grew up, I find more information about this plant with strong Rose/Musk aroma from geranium family plant which was named Attar- of-Roses, Rose Scented Geranium, Wildemalva (Africa), Drusaim / Indrusaim (Europa). 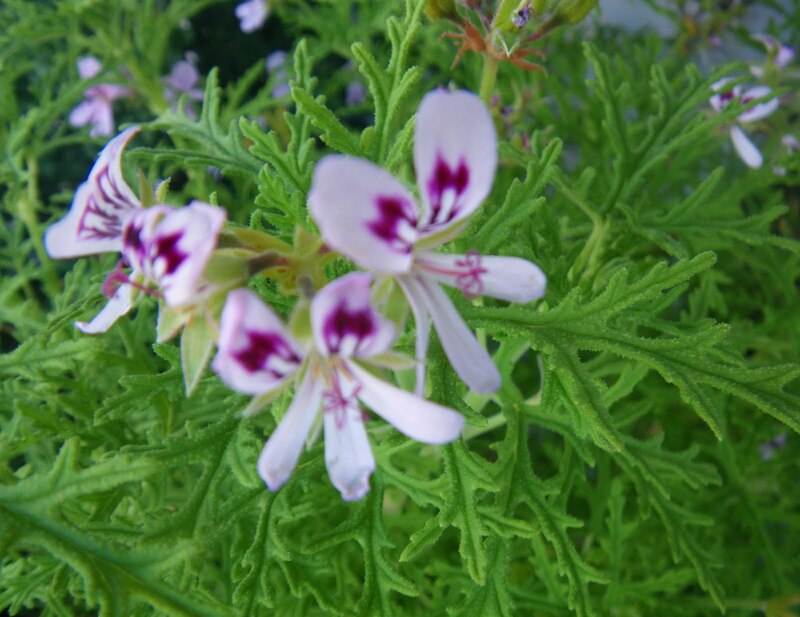 There are more then 220 species of strong - smelling Pelargoniums with attractive rose scent, having different lemon, minty, musk or lavender tones. In my garden and in flowers arrangements these plants are adding texture, fragrance, color and mystery. It is one of the old fashioned rose cultivars of Pelargoniums graveolens and has deeply divided gray green leaves edged with silver-gray. 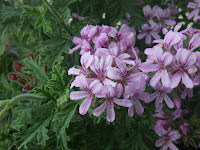 It has a distinct rose scent and small clusters of lavender flower when in bloom. 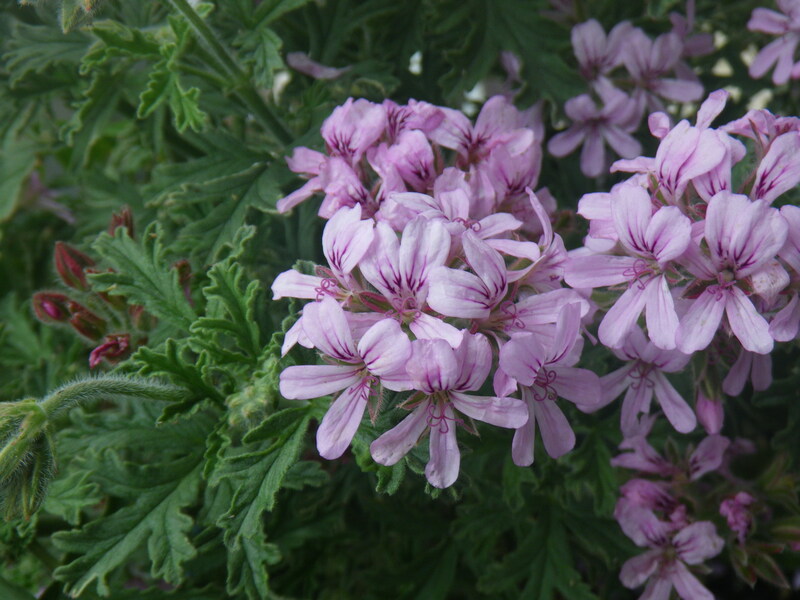 Attar of roses ( Pelargonium Capitatum var.) leaves has roundish shape with shallow, rounded lobes; are much smaller as Lady Plymouth and lack the edging color, but it is much more fragrant. The fragrance is strikingly reminiscent of a freshly cut bouquet of roses. 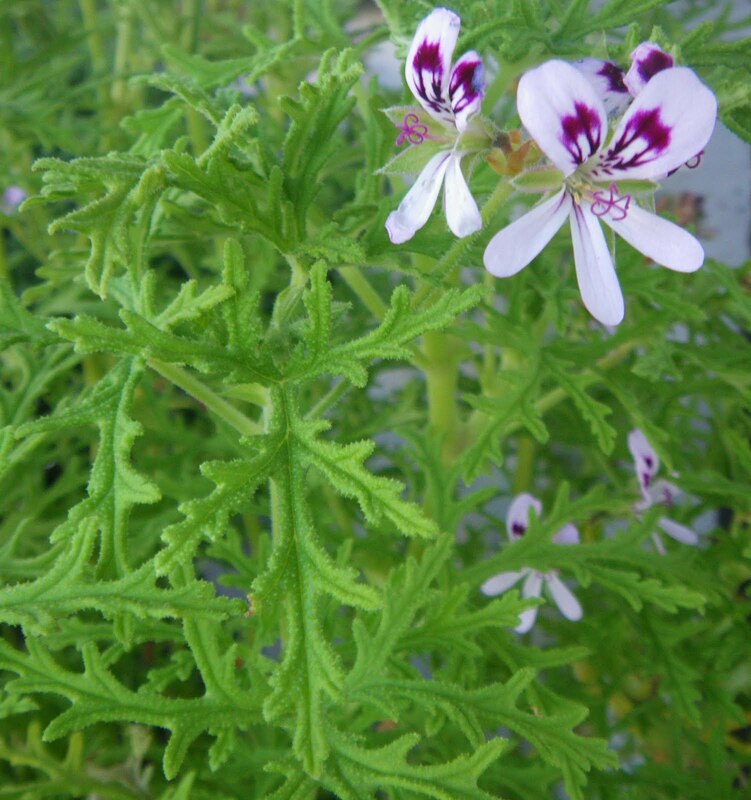 Attar means perfume and this scented geranium is intense used in perfume oils industry. Little pink flowers are great candidates for candying, for favors and flower arrangements. Another favorite is Skeleton Rose (Pelargonium x Radens). It has very crinkled leaves, shaped like curly maple leaves and vigorous habit. Their fragrance is sharp with rose fragrance and pale citrus scent. 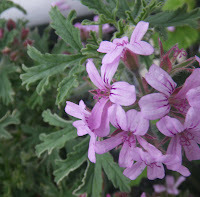 I was able to choose a variety of lemon - rose scented pelargoniums when I found a well stocked nursery in Vancouver area. I let my sense of smell lead the way when I choose two varieties of lemon-rose scent : Rober's Lemon Rose and Atomic Snowflake. Rober's Lemon Rose has a mixed and sweet lemon- rose scent, vigorous growth habit and deeply scalloped leaves with different shapes. Atomic Snowflake is a bushy tender plant with large, softly lobed leaves, white variegated with yellow/cream variegation. The foliage is strongly scented with rose/ lemon-rose and pale eucalyptus scent and in summer have many clusters of mauve flowers. Scented geraniums have a long history of use, although more for decorative purposes than for culinary use. I use their leaves in the kitchen, in the making of sweet syrups to be added to candies or drinks. I use them to flavor jellies, tea cakes and in boiled milk to extract their particular flavor before added to custards, puddings or sauces. Fresh leaves can be added to fruit dishes, too. 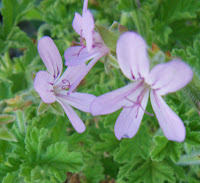 I found many recipes and more cooking ideas in "Scented Geraniums: Knowing, Growing, and Enjoying Scented Pelargoniums" by Jim Becker, Faye Brawner. 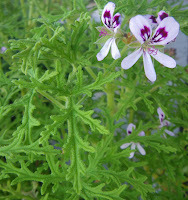 Just fill a glass jar with alternating layers of sugar and the scented geranium leaves. Seal the jar tightly and place it in the sunlight for 2 weeks, turning the jar occasionally. Sift out the leaves at the end of the time, and enjoy the scented sugar sprinkled on desserts or used to flavor cookies, cakes, teas or coffees.